Furness abbey was first founded in 1124 by Stephen, then count of Mortain and lord of Lancaster, and later king of England (1135-54). The original site was at Tulketh near Preston in Lancashire. Three years later the house was moved to a more suitable site on the Furness peninsula. Furness was part of the Savigniac congregation and therefore objected strongly to the union of Savigny and Citeaux. However their protests were to no avail and Furness was absorbed into the Cistercian Order in 1147 along with all the other Savigniac houses. The abbey, under the special protection of the Crown, developed rapidly and soon became almost as powerful as Fountains. For years the abbey remained the only religious house north of the Mersey and west of the Pennine Chain. 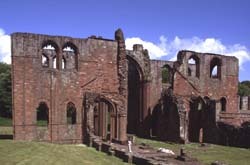 (1) The abbeys endowments were considerable; it owned lands as far away as Ireland and Yorkshire, and throughout the Middle Ages Furness and Fountains were frequently to dispute landholdings in Cumbria. (2) The rights and privileges of Furness Abbey were confirmed and extended by every king from Henry I to Henry IV, and in 1134 King Olaf of the Isle of Man, granted Furness land for the foundation of a daughter-house and the right to elect the bishop of the Isle of Man. (3) The abbey of Furness achieved some feudal independence over its lands in the north of England and the abbots relations with Scotland were much like those of a border baron; only the King of England could stand in the way of Furnesss sphere of influence. (4) The abbot was also an important person at the kings court. When the king came north the abbot collected subsidies, assisted the royal officers and judges and acted as arbitrator. (5) Furness' proximity to the Scottish border meant that the abbey was embroiled in the conflict between Scotland and England during the reign of King Stephen (1135-54). Like so many other northern monasteries the house inevitably suffered from raids at the hands of the Scots. The ascendancy that the abbey achieved over its lands in the north meant that the abbot often became involved in local disputes. For example, in 1357 Thomas of Bordsey seized the bailiff whilst he was on his duties and beat him. Following the attack, the bailiff went with a company, including Abbot Alexander, to avenge the insult. Thomas was duly captured and taken to jail. (6) By Henry VII’s reign it appears that the abbot of Furness had take over the whole process of legal activity in the area. The abbey was not only important in the north, it also sent out colonies across England and Ireland: Calder in 1135 (which moved to Byland), Swineshead in 1135, and Wyresdale c. 1196 (which moved to Abington in Limerick, c.1205). Furness was very wealthy: in the survey of 1535 the net annual income was valued at £805 which made it the second richest Cistercian house in England, after Fountains. (7) As such it should not have been dissolved until 1538/9 when the larger monasteries were forced to surrender. However, the involvement of some of its monks in the uprising known as in the Pilgrimage of Grace during the winter of 1536-7, and the fact that Furness had openly questioned Henry VIII's declaration of supremacy over the church, led to its closure in 1537. When Robert Radcliffe, a close friend of the king, entered Lancashire to quell the disturbances of 1536-7, his progress was marked by a series of executions. He suggested that Furness surrender as a voluntary discharge of conscience; the abbot followed his advice and this hastened the abbeys end. (8) The house was dissolved in 1537 and demolition began almost immediately.